Recently I reviewed a powerful, yet charming, music synthesizer app called Bebot Robot Synth. I loved the way that app combined the power of a musical instrument in the guise of a goofy dancing robot. That joyful experience led me to explore other synthesizer apps. While Bebot charmed the pants off me, my next discovery, Chris Wolfe’s Jasuto Modular Synthesizer, scared the pants off me. 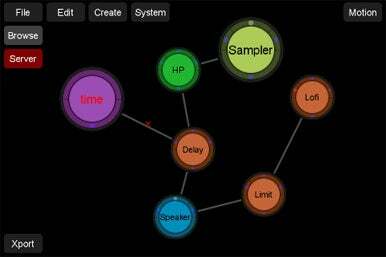 Power Tool:If you’re not thrown by things like waveforms, filters, and patches, then Jasuto Modular Synthesizer is the app for you. To be fair, though, Jasuto is a completely different type of app. While Bebot is a deceptively powerful synthesizer designed to satisfy your inner 3-year-old, Jasuto is an obviously powerful modular synthesis toolbox that’s designed to satisfy your inner Keith Emerson. Bebot hides its power while Jasuto lets it all hang out. It’s impossible to describe everything that this app can do in such a short space so I won’t even attempt it. The developer’s Website is a great resource for that information, as well as for instructions on using the app. Suffice it to say that Jasuto is not an app for the faint of heart. To get the most out of it, you need to understand the world of waveforms, filters, patches and the like. Synth pros may immediately take to the app, but if that’s a foreign language to you, you may find yourself frustrated for the first several days. Despite its complex interface, though, Jasuto is a power synthesis tool that, back in the day, would have required a huge investment of time and money. At only $3 ($5 for the recently released Pro version), it now only requires your time.